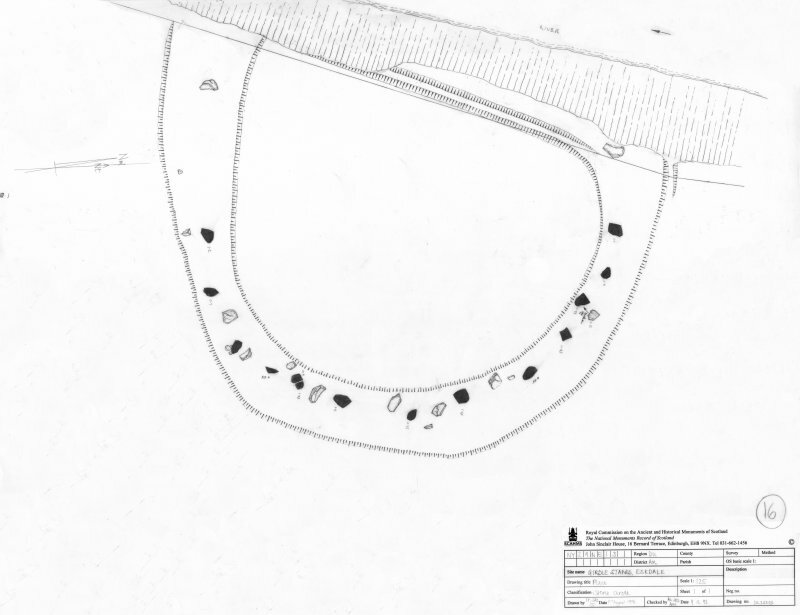 Plan of the Girdlestanes stone circle, indicating edge of river bank; redrawn for publication from DC 32355. IP, 19 October 1995. 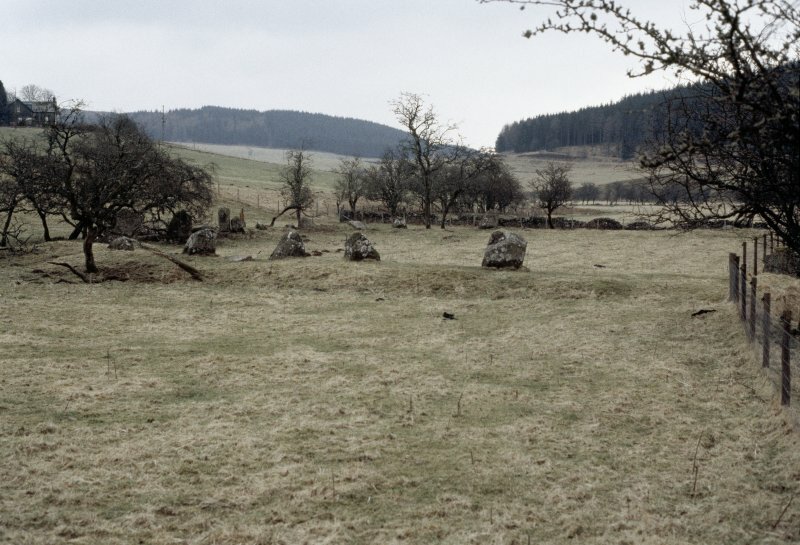 Cote, 'Girdle Stanes', stone circle. 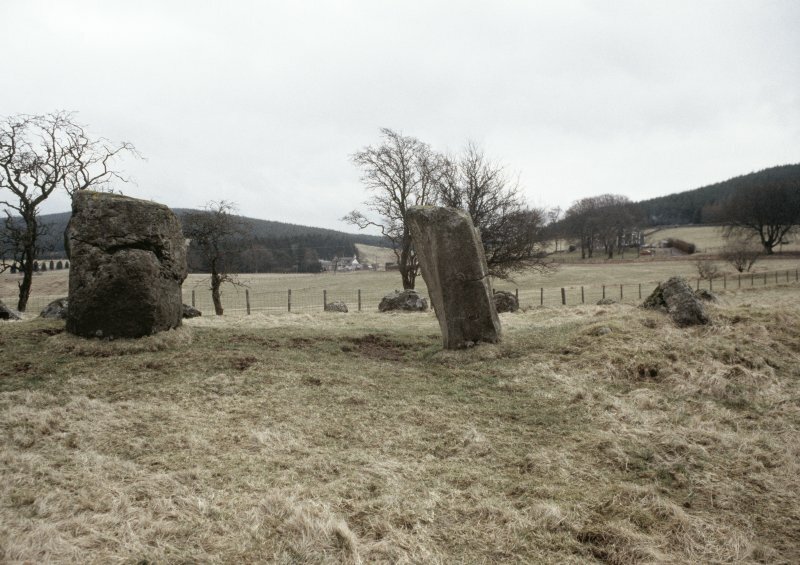 For Loupin' Stanes stone circle (NY 2570 9663), see NY29NE 11. 'Girdle Stanes', Stone Circle: The W side of this stone circle has been washed away by the White Esk. 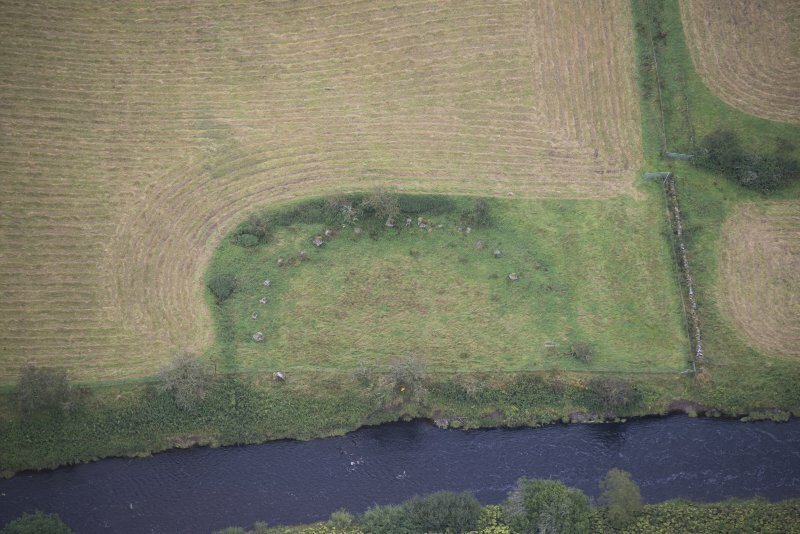 What remains is a crescentic arrangement of 26 stones, forming 2/3 of a circle, c.130' in diameter. In the bed of the stream are 6-8 boulders of no great size, possibly part of the missing arc. The stones are placed very irregularly both as regards alignment and distance apart. Of the remaining stones, 10 are erect and pillar-like, one being a double stone; 4 are prostrate pillars, 1 a flat slab, and the rest are squat. The standing stones vary from 1'6"-5'4" in height and the prostrate pillars from 5'6"-7' in length. Probably a considerable number of stones has been removed. D Christison 1897; G Goldsbrough 1912; RCAHMS 1920, visited 1912. 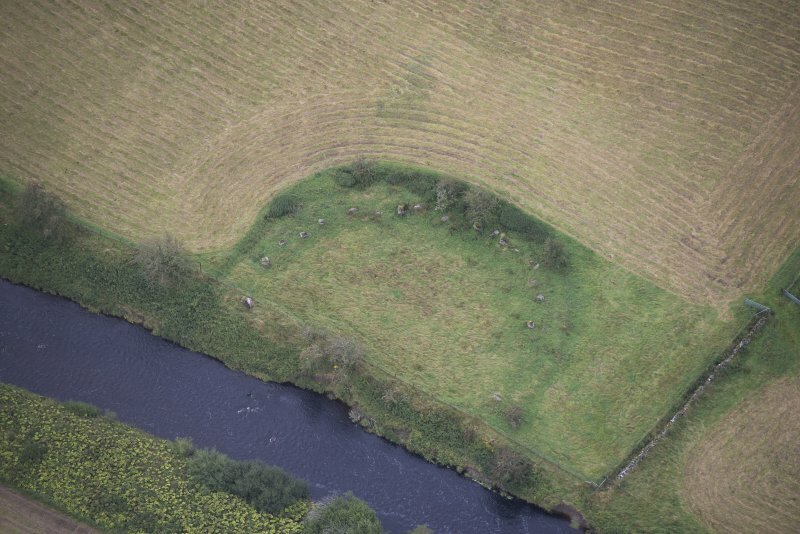 The twenty-six stones of this circle are set on a slight earthen bank c.3.0m wide. The circle is otherwise as described. Visited by OS (JP), 1 November 1973. 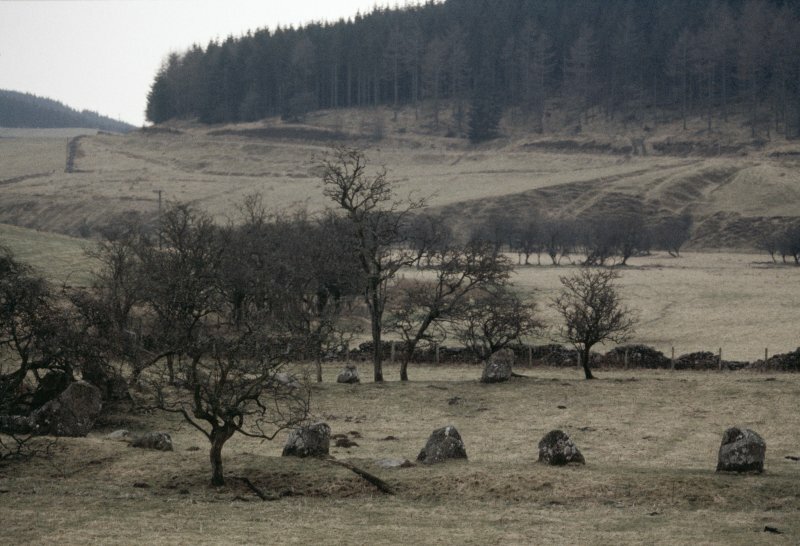 This stone circle is well-preserved. No change to previous field report. Visited by OS (MJF), 30 August 1978. 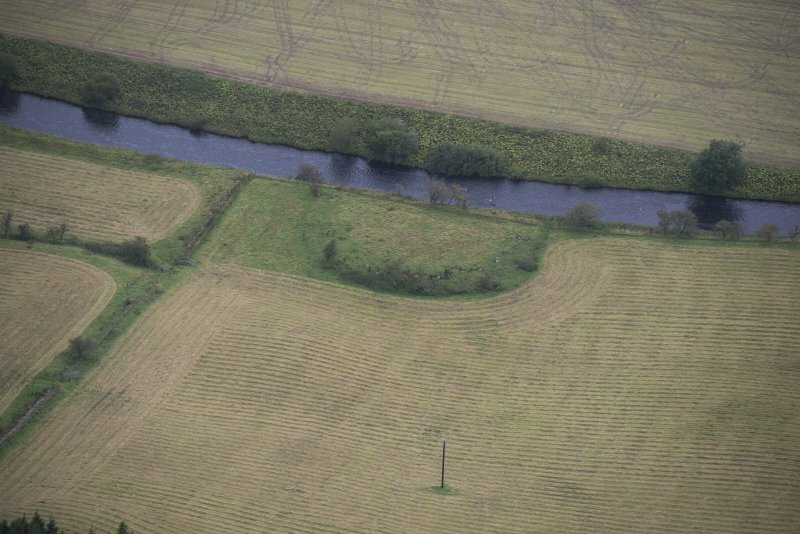 On the E bank of the River White Esk, 300m NNW of Cote farmhouse (NY29NE 82), there is a stone circle measuring about 39m in diameter. 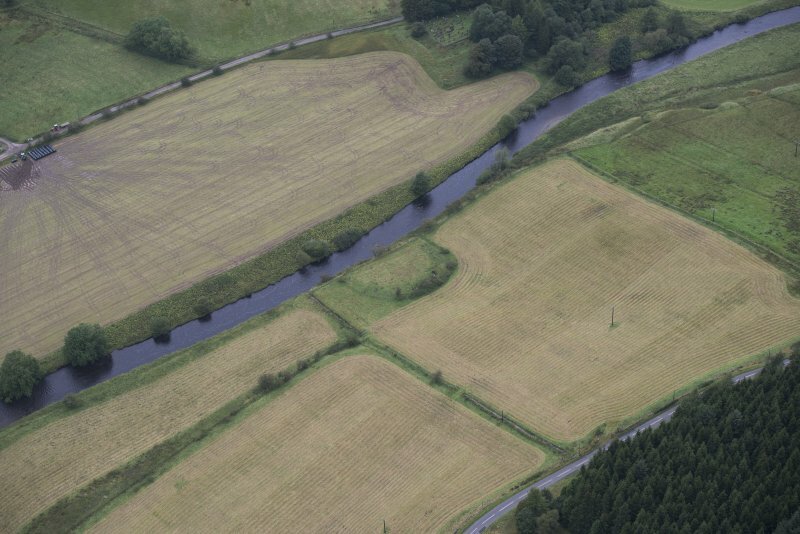 The W arc has been destroyed by river erosion but around the E there are eleven upright stones (measuring between 0.8m ands 1.8m in height) and eleven fallen stones which are irregularly spaced along the inner edge of what is probably an old plantation bank. RCAHMS 1980, visited June 1980. 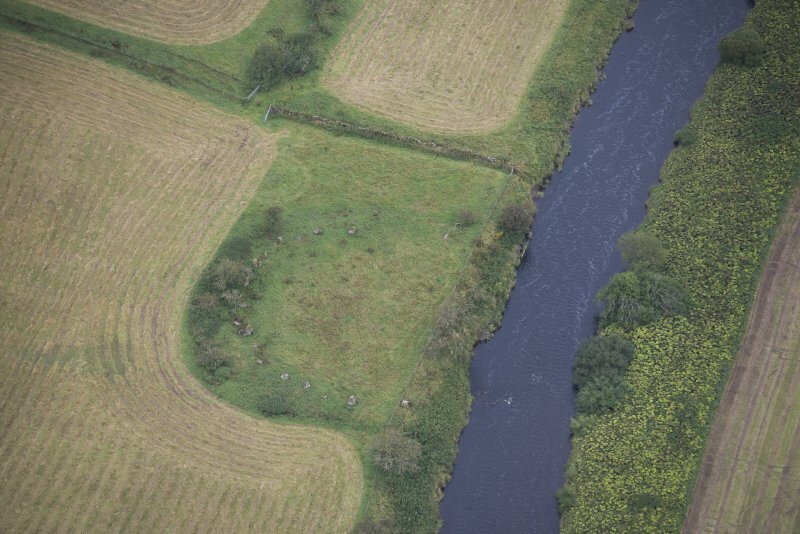 This stone circle is situated on the left bank of the River White Esk about 250m NW of Cote steading (NY29NE 82), and comprises at least twenty-one stones set on a diameter of about 36.5m. 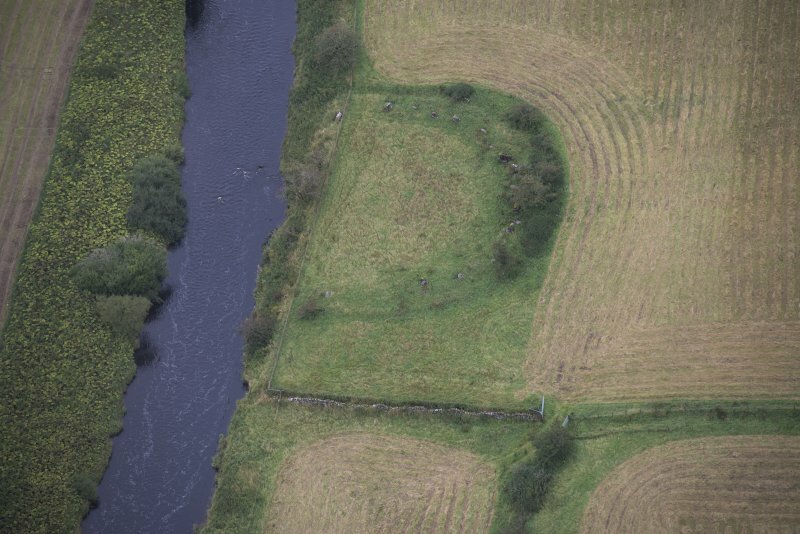 Erosion by river action has removed approximately a third of the circle, but thirteen stones, measuring up to 1.65m in height, remain standing. 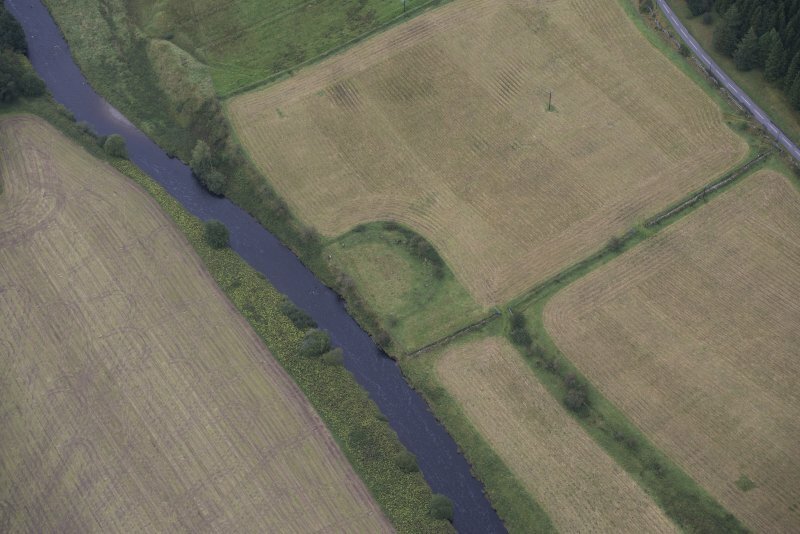 It is not known whether the low stony bank, up to about 7m in thickness, which has been thrown up along the perimeter of the circle is an original feature of the site or no more than field-clearance or a hedge or plantation bank. Visited by RCAHMS (JRS), 1 August 1991. 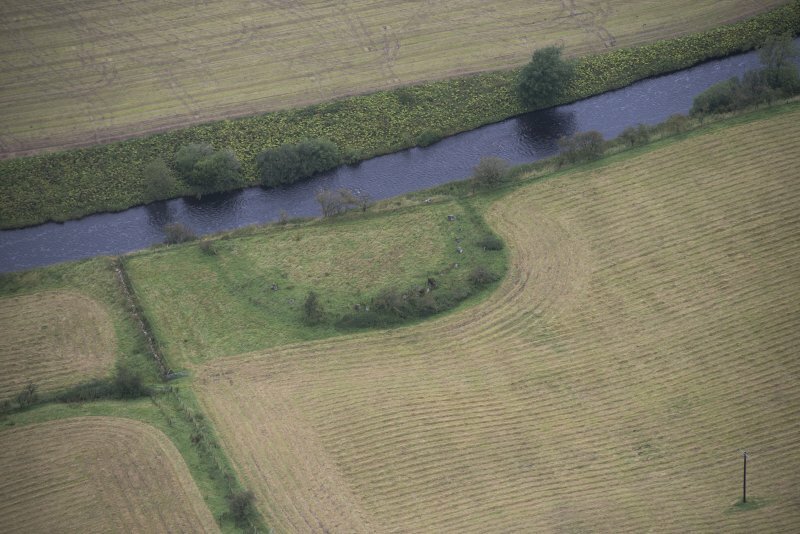 A preliminary geophysical survey of this site was carried out by GeoQuest in November 1993. 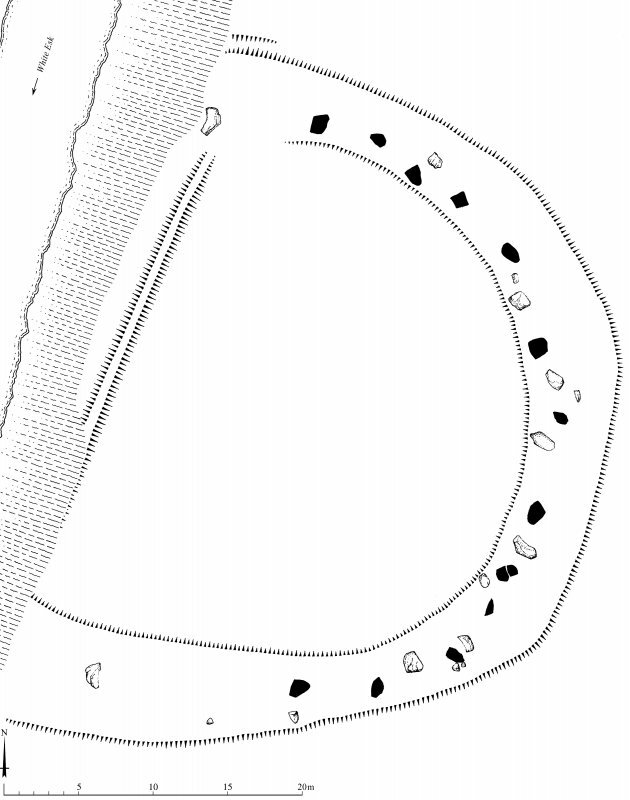 Geomagnetic data indicated several pits within the enclosure, with additional pits along the line of the stone circle. 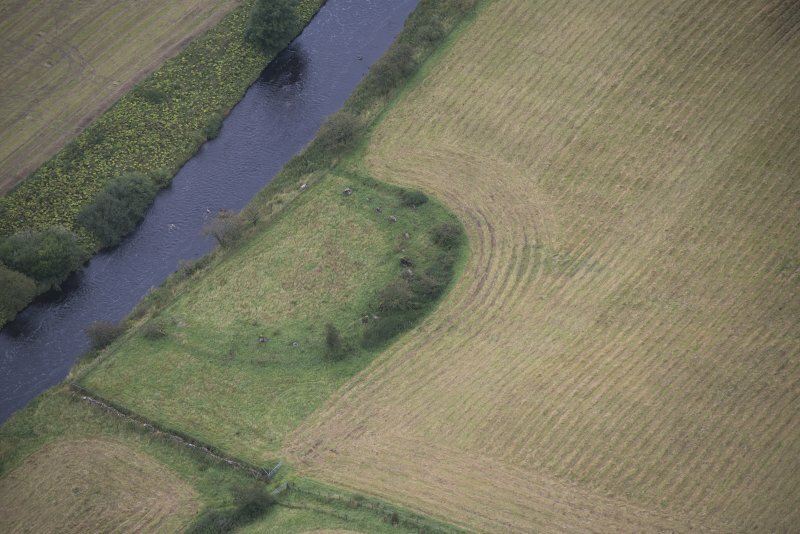 A weak magnetic anomaly suggested a narrow bank of stoney material, about 8m outside the stone circle. 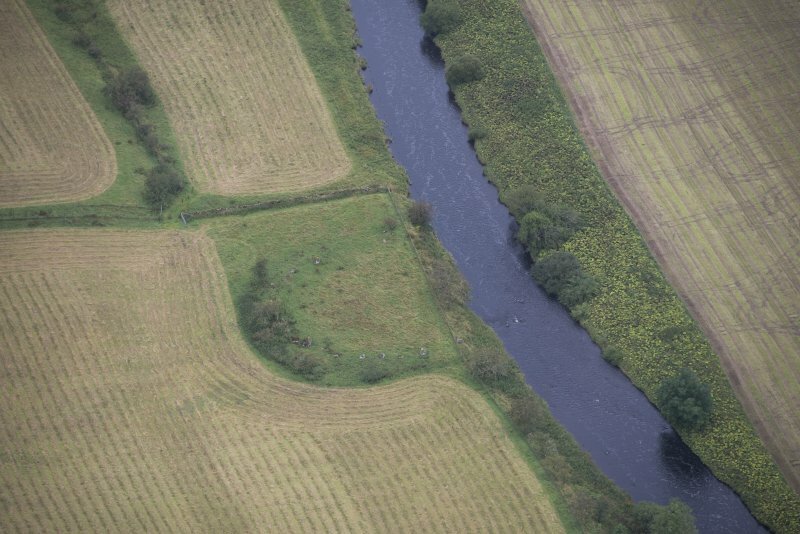 No evidence was found for an enclosing ditch within the surveyed area. Information from GeoQuest Associates, 1994. Information from Historic Scotland, scheduling document dated 29 October 2010. OS (GIS) MasterMap, November 2010.